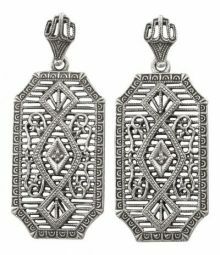 The filigree earrings that are offered are reminiscent of Edwardian and 1920's Art Deco style with intricately designed filigree and embossed patterns. 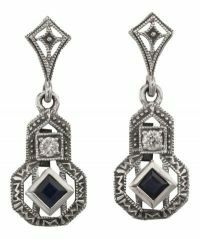 Many styles are hard to find such as the Art Deco black onyx, lapis, frosted quartz crystal tablets, star burst crystal or marcasite. 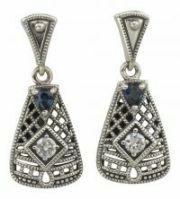 All gemstones & diamonds used are genuine unless noted. 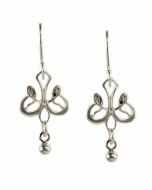 Estimated 5 to 7 days shipping time (subject to availability, not all items shown are available but may be back ordered), please allow extra days for delivery. 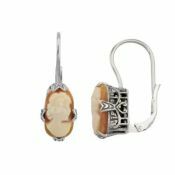 50 Items. 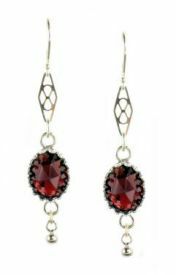 Showing Items 1 thru 15. 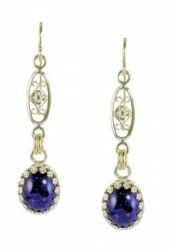 Antique designed earrings with vintage Czech lapis Glass in a crown bezel frame suspended from filigree floral links. Manufactured to order. 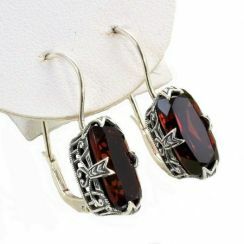 Antique designed sterling silver dangle earrings with 10x8mm oval shaped rose cut garnets in a crown bezel frame suspended from filigree links. Manufactured to order. 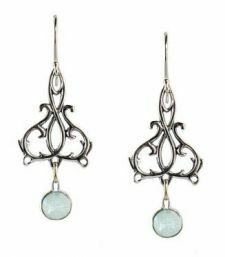 Art Nouveau inspired earrings with a single ball dangle suspended from petite scrolls on French ear wires. Manufactured to order. 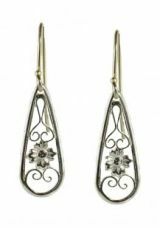 Vintage inspired earrings with a single embossed flower surrounded in scroll work tear drop dangle. Manufactured to order. 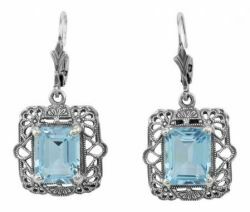 Antique foliate scroll designed earrings suspending a rose cut 1.0 carat sky blue topaz in a simple bezel frame. Manufactured to order. 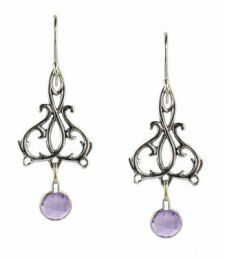 Antique foliate scroll designed earrings suspending a rose cut .75 carat amethyst in a simple bezel frame. Manufactured to order. 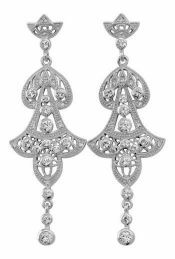 Featuring intricate filigree work that has an embossed scroll pattern with a diamond accent in the center. 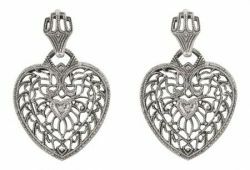 Featuring intricate filigree work that is heart shaped with a diamond accent in the center. 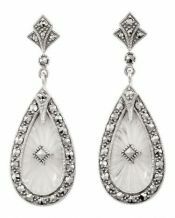 Featuring a tear drop shaped frosted starburst crystal surrounded by a marcasite accented frame. 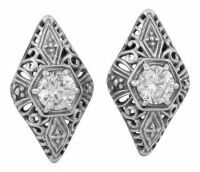 Featuring a hexagon shaped frame that has a beaded edging and filigree with millgrain detailing. 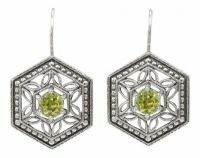 Available in amethyst, garnet, blue topaz, peridot, cubic zirconia and white topaz. 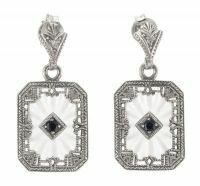 Featuring a 12x6mm shell cameo set in a filigree frame with claw prongs on lever backs. 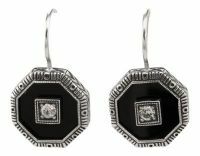 Octagon shaped black onyx with cubic zirconia accents encased in an embossed frame on posts. 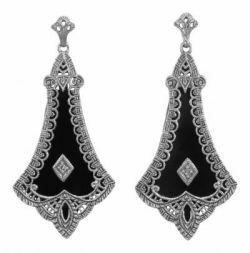 Octagon shaped black onyx with cubic zirconia accents encased in an embossed frame.